If you're one of those people who is looking forward to cuddling their dogs at the end of the day, then you are not alone. However, these can be momentarily stopped by dog ticks and the dogs smelling like they haven't had a good wash for quite some time. You shouldn't worry much for there are medicated dog shampoos you can buy for your dog. Take a look on why you should opt to pick up a medicated dog shampoo rather than the usual supermarket dog shampoo that's out there in the market. What are Medicated Dog Shampoos? What are the Types of Medicated Shampoo for Dogs? When will I need to use Medicated Dog Shampoos? What are the Precautions when using Medicated Dog Shampoos? What are the Benefits of using Medicated Shampoo for Dogs? Medicated dog shampoos are very much like similar to prescription shampoos for humans. You use these prescription shampoos when you have a skin condition which affects your hair. These principles come close to the dog shampoos. Medicated shampoos for dogs are a specialized type of shampoos which you can use if your dog is having skin or coat problems that may have been triggered by allergens, fungal and bacterial infections, parasites or your dog's dry skin. It's best if you can talk to your veterinarian first to check if your dog has indeed underlying skin conditions before buying these shampoos. To dogs with normal skin coat conditions, this may not affect them as much as it would for pups with skin conditions. Trust us, these dog shampoos will do them wonders and you can comfortably cuddle them with ease and peace of mind. There are quite a number of different types of medicated dog shampoos. This is because different dog skin types will require a special kind of dog shampoos. Basically, there's a specific pet shampoo for any of your dog's needs. These are the dog shampoos you have to purchase for when an active infection is the cause of your dog's skin condition. The common diagnosis for this infection is Malassezia dermatitis or commonly known as yeast infection. This is also considered to be effective against ringworm problems not only for dogs but for cats as well. More often than not, these skin infections are brought about bacteria or fungi. The thing is, there are bacteria and fungi present almost everywhere, and yes, even at your own home. Thus, it's really crucial that you protect your pets from these kinds of foreign invaders to keep your dog's coat as healthy as possible. Seborrhea, or dandruff, is one of the most common skin problems. It causes a red and itchy rash that deposits white scales. Dogs would have these conditions, too. To solve this problem, you would have to buy a medicated dog shampoo for itchy skin. Usually, these are solved by tar-based shampoo which can soothe your dog's itching and remove the flaking skin to restore your dog's soft skin back to its original state. This medicated dog shampoo is specifically made for dogs who are suffering from chronic seborrhea or dandruff and itchy skin condition. For this, the condition is very much repetitive and worse than the usual flaking so the selenium-infused option would be working far greater than the usual tar and coal shampoo. This will also reduce itching and flakes the same way as the tar and coal shampoo does, but works greater to some extent. For dogs with fungal infections, shampoos with salicylic acid and sulfur have a very strong antifungal property and could relieve itching at the same time. This works milder than other dog shampoos so these are great for dogs who suffer from this kind of skin condition but reacts sensitively to stronger-formulated dog shampoos. With salicylic acid dog shampoos, you won't have to worry about irritating your dog's sensitive skin even further. These dog shampoos are used for skin conditions that directly affect the hair follicle. The usual conditions are Schnauzer Comedome Syndrome or Demodectic mange. These are very strong skin conditions and will definitely stain your dog's coat. Therefore, a bleach ingredient should be added to the medicated dog shampoo to wash off the stain while treating your dog. This type of shampoo, however, will need to be handled with extra care as it is a hassle to work with them. Douxo’s Sogeval Chlorhexidine dog shampoo is formulated with an antiseptic foaming solution which contains chlorhexidine, phytosphingosine salicyloyl, and lipacide c8g. 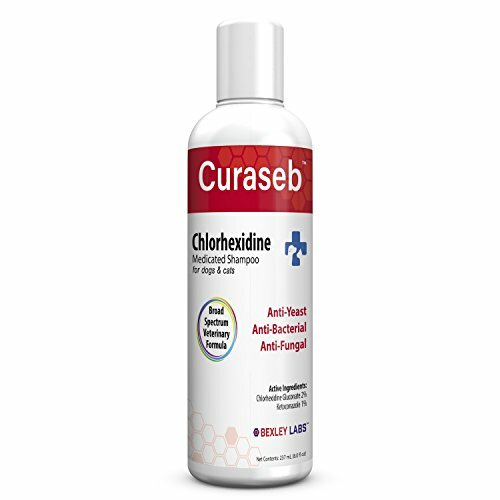 Chlorhexidine contains strong antiseptic activity which can help clean out the bacteria lying on your dog’s coat. It also contains phytosphingosine salicyloyl, which basically is a modified pro-ceramide, which can prevent your dog from getting dandruff and control other skin disorders that are associated with pyoderma. This dog shampoo also moisturizes your dog’s skin from preventing it from irritation and loss of moisture. 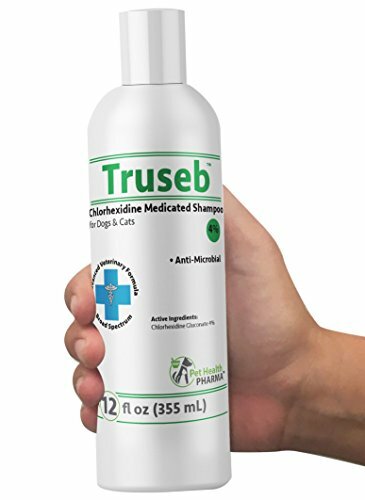 Truseb is a medicated shampoo for dogs and cats and it is proven to be effective against bacterial skin conditions. It is also formulated with an advanced veterinary formula which can give your dog 100% satisfaction. The 4% chlorhexidine gluconate component is geared towards the elimination and prevention of growth of diseases which can cause further proliferation of microorganism and bacteria to your dog’s skin. This works as a therapeutic bath which can help promote healthy skin and coat. It can also treat a broad spectrum of skin-related problems at the same time, you can also include this into your weekly routine. This will surely keep your dog’s ears safe and healthy. This dog shampoo is infused with prescription-grade chlorhexidine gluconate which can be used to cleanse skin or wounds for skin infections and clean your dog’s ears. It can also treat infections such as dermatitis, acne, and pyoderma. It also quickly stops the smell and can restore your dog’s natural healthy state. Pet MD benzoyl peroxide shampoo features a relief of scaling and itching from certain skin conditions such as demodectic mange which is caused by mites, skin infections, and follicular plugging which can help stop scratching and pain. It has antiseptic, antibacterial, and antifungal ingredients which can ultimately give your dog some ease by relieving dry, itchy and irritated skin and pyoderma. It is made up of peroxide, micronized sulfur, and salicylic acid for more powerful cleaning and degreasing. It is made up of natural ingredients which are soap and paraben free. It also contains skin moisturizers and deodorizes to effectively remove scales and oils from the coat. 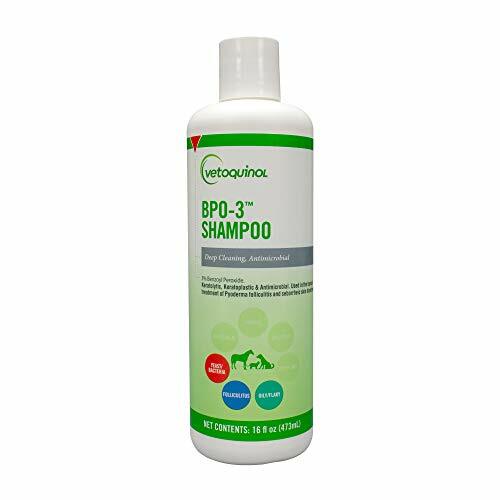 The BPO-3 shampoo provides a safe deep-cleaning for your dogs. It contains a unique formula which has a combination of natural soothing agents, moisturizers, and vitamins. It also has clinical ingredients included to work for smoothing hot patches, bug bites and oily, flaky, itchy, scaly and red skin. It is also formulated to gently cleanse and nourish your pet’s skin while helping to degrease the coat. It has benzoyl peroxide which can help improve various skin conditions by opening and flushing hair follicles. This medicated shampoo is concentrated shampoo that is highly-effective at soothing skin conditions in dogs and different kinds of pets. It contains unique clinical ingredients which can help combat the side effects of skin issues. It deeply cleans the roots of your dog’s hair glands which helps flush out any oil build-up that can cause skin irritation and help protect against chronic skin issues and diseases. Mynetpets is an oatmeal dog shampoo which has colloidal oatmeal granules that can adhere to the surface of the skin which anchors moisturizers and make the skin softer. It also has an additional moisturizing property of aloe vera which can help soothe redness and reduce inflammation on irritated skin. It is safe for your dog as it hypo-allergenic and has a soap-free formula that is designed for sensitive and itchy skin. It is also mild and gentle so it is very much ideal for frequent use on dogs, puppies, cats, and kittens. It is composed of 2% colloidal oatmeal which is a hypo-allergenic formula which mainly benefits sensitive, dry or irritated skin. It promises great results from the finest ingredients and product formulation which is created for the veterinary and grooming industries. The Four Paws Magic Coat Grooming solutions feature and an easy-to-use color-coded system to help owners select the best products for pet coat and grooming needs. It is formulated to relieve itching and dryness of the coat and skin. The best thing about this product is that is tested, proven, accepted and highly recommended by professionals. 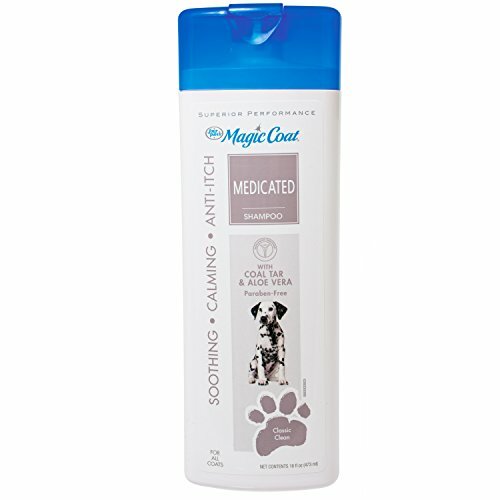 It is also perfect for all coat types and is available in a 16-ounce bottle. The Curaseb medicated shampoo for dogs contains ketoconazole and aloe which is proven to be effective against ringworm, pyoderma, and allergies. It eliminates yeast, bacteria, fungus, pyoderma, and ringworm with the help of chlorhexidine and ketoconazole. This combination is used to deodorize and gently cleanse skin. The veterinary recommended shampoo will eliminate the smelly, musty odor from your pest skin that is caused by yeast, bacteria, and fungus while leaving a pleasant and refreshing cucumber melon scent. The manufacturers of this dog shampoo also guarantee to give you a full refund if you are dissatisfied with the product. 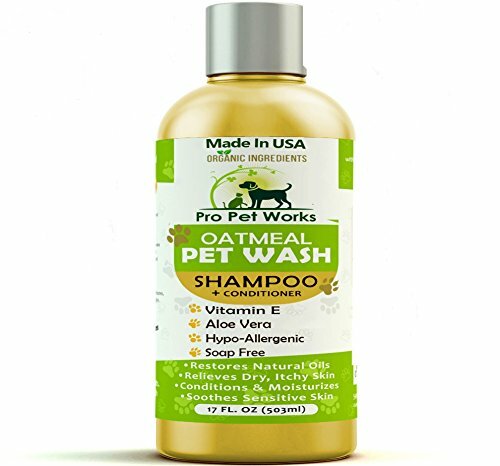 This Pro Pet Works Natural Oatmeal dog shampoo and conditioner is great for dogs and cats. It is hypoallergenic and soap-free, made with natural oils and aloe that are organically blended made especially for pets who have allergic reactions and sensitive skin. This oatmeal dog shampoo is recommended by veterinarians and is specially formulated for pets with allergies to food, grass, and flea bites. This shampoo and conditioner mix can be used for a wide range of pets – from dogs, cats, ferrets, and rabbits. It has a cherry almond smell that is guaranteed to have no alcohol, sulfates, added colors, harsh chemicals, and fragrance. It is made from all-natural ingredients and the manufacturers even offer a 100% money back guarantee for this product. Its natural and organic ingredients are made for dry, sensitive, and itchy skin. It is infused with organic aloe vera and almond oil that is therapeutic for you and your dog and adds that additional smoothness to your pet’s skin and coat. The formulation is aloe-enriched, soap less and detergent-free shampoo and conditioner that makes bath time a pleasure instead of a chore. It is also infused with vitamins A, D, and E that won’t irritate your dog’s eyes, nose, or skin while bathing. These vitamins and nutrients make it easy for you to easily brush your pet’s coat and smell clean days even after bathing. It’s guaranteed to be tough on dirt, but not on your pet. Aside from that, the creators of this product are very much committed to saving the Earth and Mother Nature as they strive hard to create a small print on the environment by making their products 100% biodegradable, natural, and made with recycled materials. Their dog shampoo products are non-toxic and non-alcoholic with no animal by-products and are also paraben and cruelty-free. The Veterinary Formula Clinical care dog shampoo is made to have a soft touch. It is antiparasitic and antiseborrheic and it contains coal tar, salicylic acid, and micronized sulfur to treat skin scaling caused by seborrhea, relieve manage, and other parasitic infections. This can also treat fungal and bacterial infections and it contains colloidal oatmeal and allantoin that hydrates skin and promotes faster healing. Its fast-acting ingredients work in a fashion that helps relieve the inflamed scalp, greasy, or waxy skin, red skin rashes, bald spots, itchy and flaky skin that is associated with dermatitis, mange, seborrhea, parasitic, and bacterial infections. This can be used up to 2-3 times a week initially and less frequently as skin improves. It is paraben, dye, and soap-free and it will not remove the topical spot-on flea and tick treatments. It has been proven to safely treat fungal and bacterial skin infections, especially skin scaling that are caused by seborrhea, and parasitic infections like mange. This pet shampoo is specially formulated for dogs over 12 weeks of age. It has pH balanced treatment that is ideal for your dog’s sensitive skin. This is great for pets with sensitive, allergic and yeasty skin. 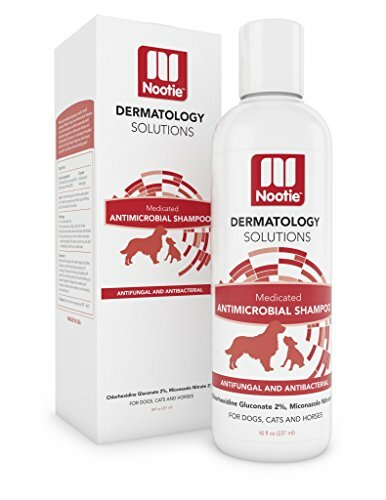 The Nootie Medicated dog shampoo is antifungal and antibacterial. It’s also very much easy to use! You can just lather it and rinse it to soothe the irritation and strengthen your dog’s coat. This pet shampoo also works on different kinds of animals like cats and horses. You will just need a small drop of this medicated dog shampoo and it will certainly go a long way. Its super concentrated formula forms a rich lather. You can just let it stand for 5 to 10 minutes, and after rinsing, your pup will have a revitalized coat and is both looking and smelling his best. It is formulated to attack the problem at the source, with 2% chlorhexidine gluconate and 2% miconazole nitrate, it goes after bacterial infections and commonly seen parasites in pets such as ringworms. These are just some of the diseases which can make your pet feel miserable and can potentially lead to bigger problems down the line. You also don’t have to worry about getting that chemical scent for this dog shampoo smells naturally pleasant. It also includes essential oils which means your dog’s coat will not only be disinfected but will also be cleaned and rejuvenated. Before using medicated shampoo for dogs, you should be able to first consult your veterinarian with what he's going to advise you to use. If you are noticing something's off with how your dog behaves, then maybe it's because he's feeling a little under the roof. Here are some of the conditions you would need to use a medicated dog shampoo for. Dog allergies – Environmental allergies are the most common and could easily be solved by medicated shampoo for dogs. The dog shampoos remove the allergic triggers from contact with the skin and also reduces the allergic reaction, itching, and inflammation. You can notice if your dog has allergies if he is just about to chew his whole skin run dry. Other symptoms of dog allergies include seasonal or year-round itchiness, excessive licking, scratching, and rubbing, hair loss, inflamed skin or “hot spots”, chronic ear and skin infections. Fungal and bacterial Infections – Fungal infections, such as yeast infections and ringworm, as well as bacterial infections would need medicated dog shampoo to treat it out. These conditions are usually uncomfortable and you might be recommended with an antibacterial and antifungal shampoo. These shampoos are incorporated with chlorhexidine and ketoconazole ingredients that can get rid of the current skin infections and could prevent a new one for pets who might get the same condition. Bacterial and yeast infections are frequently secondary conditions which mean that the dog is probably fighting other immune system conditions. These dogs are generally more prone to infection. Once the primary issue is under control, then regular bathing with dog shampoos that are medicated can help with the relapses. When choosing the best antifungal and antibacterial dog shampoos, you have to take note of the ingredients. Make it a priority to choose those with calming ingredients since dogs who have a history of skin infection may have easily irritated skin. A good antibacterial shampoo for dogs should also be non-drying and mild to the skin. Parasites – Fleas are well-known parasites that can trigger skin problems in dogs. It’s the allergic reaction to flea bites that makes these bugs so hard to treat and irritating for the dog. You can also use year-round prescription flea and tick to prevent these parasites. However, if the problems are more serious, then a dog flea shampoo can quickly kill and remove adult fleas. Mites, on the other hand, are also parasites which are responsible for unpleasant dog skin conditions such as hair loss, scabs, body sores, and itching. Generally, this is called “mange”. Dry skin in dogs – Dry skin in dogs can be caused by different causes such as low humidity levels, dietary imbalances, and excessive bathing. Medicated dog shampoos with moisturizers can remove flakes and ease the itchy feeling your dog feels. First up, before choosing medicated shampoos for dogs, you have to check with your veterinary first to confirm what your dog will truly need for his treatment. If, however, you urgently feel like your dog will need a shampoo to help relieve his condition anytime soon, you have to take note of the conditions your dog is currently feeling or showing and try to match it up with the reviews for dog shampoos. The risk is this is going to be a trial and error and remember that you could do more harm to your dog that something good when it comes to self-medication. However, prevention is always better than cure. With this, you can be assured that your dog may not feel the need to show signs of any skin conditions. Those are just some of any type of medicated dog shampoo could fix. These are the direct benefits of using dog shampoos that are medicated. Come to think of it, however, if your dog is free from itching and is very much comfortable in his own skin, both literally and figuratively, then it simply means more loving time for you and your dog. There are sometimes when a regular dog shampoo just won't work. This is when your dog doesn't just need to be clean and smelling good, but he has to get rid of all the itch and dry skin. For this, a regular dog shampoo will not just be enough and that's why you will need a medical dog shampoo. There are different kinds and types of shampoo and you can find a suitable one for your dog's needs. 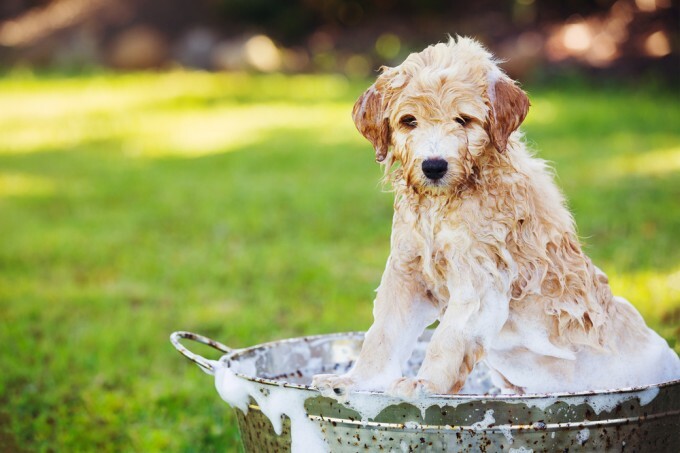 However, there are several precautions in using these shampoos as it contains medication and can potentially cause harm to your dog if it's not applied the way it should be. Overall, these dog shampoos will truly change your dog's view on bathing.